How to melt ice & snow? A unique formulation of potassium, calcium, magnesium and sodium chlorides and coated with calcium magnesium acetate (CMA). 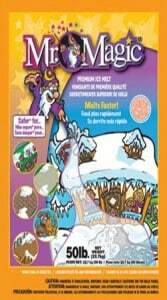 Mr. Magic® is your answer to how to melt ice and snow. Melts to -10° and with its bright orange coating ensures visibility and proper coverage of product. Available in 40 lb bags (63 bags per pallet).